If you live in the BOP region and would be interested in meeting up with other windsurfers for social and/or competitive activities etc. 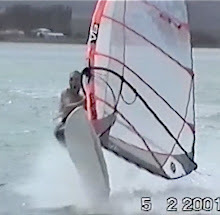 then visit http://bopwindsurfers.blogspot.com/ and leave a comment and your contact details. If you have always wanted to know more about windsurfing but didn't know where to start. Come down to our clubrooms at 2pm and check it out. All going well (weather permitting) we will have our learning gear out and will be showing people the very basics required to get into windsurfing. Learn (on land) the basics of getting started. Thank a coach and win them prizes! Recognise a great yachting coach with a nomination in the SPARC Volunteer Coach Awards 2010 and win them great prizes. Every nominated coach receives a letter of thanks from your local Regional Sports Trust and goes into a draw to win one of 17 $100 sports vouchers.Three nominated coaches in each region are also awarded regional titles. A windsurfing club is a great way to get into windsurfing. Your local windsurfing club will will introduce you into your local windsurfing community. A solo sport like windsurfing can make it hard to get advice on where to sail, what to buy and what to do. By joining a club you'll get all these things an so much more. BBQs, film evenings, instruction days, trips away, competitions, friends and sailing partners.